4x console power in a games machine you can build yourself for £300? We show you how. Even in this era of austerity, things are changing for the better for the prospective PC buyer. Where before the £500 mark was considered the sweet spot, the law of diminishing returns for new processors and graphics cards is fast gaining traction, meaning the best ratio of "performance to the pound" is increasingly beginning to crop up around the lower-end of the scale. Our recent dissection of Acer's latest Ultrabook put this into an encouraging perspective. Here, we were able to enjoy modern DirectX 11 titles such as Battlefield 3 on a modest 1.6GHz dual core CPU setup with a discrete NVIDIA graphics chip. This has huge implications as far as cost efficiency is concerned for those building a desktop PC from scratch, where higher-clocked processors and cards are available for a fraction of the price of their mobile counterparts. With this in mind, and taking into account the kind of price tag a new console might be launching at, we ask ourselves: is it possible to build a respectable gaming PC on a budget of no more than £300? To what extent are we able to out-perform console and how much are we actually missing by not opting for the default quad core CPU/high-end GPU most PC enthusiasts would recommend? If we take as given that ultra level graphical quality options are off the table, what kind of gaming performance can we enjoy? Let's just say that the results of our tests were very surprising. Naturally, the challenge is in knowing where to compromise, and picking out parts which offer the best gaming performance for their cost. No doubt console manufacturers face a similar dilemma when it comes to cementing specifications they'll be tied for years, but in this case, PC users have the option to upgrade whenever they want. It also differs in that we're able to design the PC's strengths around what we already know about the games available. Settling upon a final spec was agonising to say the least, but this is the parts selection we went for and the prices we paid. Note that prices do vary quite a bit. We paid £55 for the 500GB HDD, but days later a similar capacity drive was available for £48. But at the same time, the Radeon HD 6770 GPU increased in price to compensate. By our reckoning you may be able to save around £15 by shopping about between the major e-tailers. If you can save £30, that brings the Radeon HD 6850 into the equation - and a whole lot more rendering power. Total parts cost here is £312.77 but note that we bought 8GB of RAM at £32.99 in order to test the difference between 4GB and 8GB of RAM. Single sticks of equivalent RAM cost £17.00 and in all of our testing we used just a single stick. Doubling RAM made no appreciable difference to our performance tests. Sticking with 4GB gives a total price of £296.78. By our reckoning, US readers would pay around $400 for the same set-up after rebates, though there are some amazing deals for the NVIDIA GTX 460, which seems to come into budget and is an obvious upgrade over the HD 6770. When it comes to gaming, a good quad core CPU is established as the "must have" component for a gaming PC - a dual core i3 at a push. But the fact is that even Intel's budget-orientated dual cores offer great performance at extremely low price-points and in many cases they outperform the previous generation Core 2 Quads. The Pentium G840, a £55 dual core Sandy Bridge processor clocked at 2.8GHz, fits the bill nicely for our purpose - and should comfortably outperform the 1.6GHz ultra-low voltage CPU that impressed us so much in the Acer Timeline Ultra M3. Knowing that most games aren't optimised to utilise all the cores available to them perhaps makes quad core processors a luxury that doesn't necessarily offer as much value. Where the goal is to get the majority of games working at a target 720p at 60 frames per second with decent anti-aliasing, the £89 Core i3 looks overpriced when benchmarks suggest that the performance boost you get from it simply doesn't justify the 63 per cent price increase over our G840. It's often the case that graphics cards prove to be the bottleneck in performance for budget rigs. Fortunately, the Radeon HD 6770 stands out for currently being the cheapest card to offer 1GB of higher bandwidth GDDR5 memory, breaking away from the lower tier DDR3 cards which would limit performance. It also comes out top in many "FPS per dollar" charts we see dotted around the internet. At around £70 (if you shop around) it's considerably cheaper than the card that many would consider to be the default choice: the £120 Radeon HD 6870. It also happens to pair nicely with ASRock's H61M-P31 motherboard, a cheap but solid micro ATX foundation to build on, offering just the one PCIe 2.0 slot we need. We also have two DIMM slots at our disposal here, supporting up to 1333MHz speed DDR3 RAM. In this case, we find that one block of 4GB gives us enough headroom for just about any game, where 8GB would prove wasteful given the requirements of most. It's only a £17 upgrade, but in a budget-orientated rig, that money is perhaps better spent elsewhere. The next part of the equation is finding a case to house all these parts, and an accompanying power supply. The trend for most console manufacturers is to avoid shelling out too much on the externals in order to keep the budget focused on boosting performance, and that's a mantra we're happy to echo here. For £16, the Casecom MA-1199 matches our mATX motherboard nicely and actually surpasses our expectations in terms of overall quality. It comes pre-installed with an 80mm fan at the rear and the thin metal casing keeps it lightweight overall. Very few of its edges prove sharp to the touch, which is a relief considering this can be a problem with some other budget solutions. In choosing a power supply, we opt for a 430 watt model by Corsair which uses a single, dedicated +12v rail; while not the largest capacity you'll find, it still gives us plenty of breathing room. Calculating the total draw of the machine, factoring in a DVD-RW and boot HDD as well, puts us around 100 watts below this threshold, so a fair degree of scope for hardware upgrades - especially in an era where Intel, AMD and NVIDIA are targeting power efficiency aggressively. As a bonus, it features a single 6-pin PCIe connector that gives us all the juice we need to drive the HD 6770 - though another can be added for future, more power hungry GPUs by converting two of its four molex connectors. As much as the notion of using an SSD for a boot drive tempts, to stay on the economical side we stick with a traditional 500GB HDD, allowing us to install as many games as we need. Unfortunately, sourcing even these at a decent price is currently tricky business, with all major suppliers bumping up their RRPs in reaction to a lowering of supply - a result of the floods which ruined the main manufacturing plants in Thailand. The time when we could buy a 1TB drive for under £40 are over and now frustratingly we're facing a charge of £48 for a drive half that size. This is the most disproportionately priced component, and looking forward, will be the area where the biggest savings will come from should we have waited. "Putting all the parts together is fairly hassle-free and takes no longer than two hours for anyone handy with a screwdriver and with the most basic knowledge of how PC components manage to slot together." Putting all the parts together is fairly hassle-free and takes no longer than two hours for anyone handy with a screwdriver and with the most basic knowledge of how PC components slot together. This is mainly by virtue of the case being easy to handle. The only trouble we have during construction is with fitting the power supply unit, which refuses to slot in at the top without bending the metal supports on the case a few millimetres first. Fortunately the metal's flexibility makes this is easy to do, though it still takes a firm push to slot the PSU home fully. The only other surprise is the lack of re-attachable cover-plates for the PCI slots at the back - once you've bent away the metal plates to make room for a GPU, they can't be reused. For a step-by-step rundown on how we built this unit, please feel free to check our in-line gallery above, which chronicles the "making-of" process in pictures. Once we're all cabled up and switched on, we find the option to overclock the CPU through the BIOS is there, which surprised us bearing in mind that the H61 chipset is renowned for its lack of overclocking prowess. We prefer to keep the core clocks at default values regardless, and find that the processor idles at 30 degrees Celsius and runs at 54 under load, suggesting that there's no need to buy an aftermarket cooler for this set-up - the bundled heatsink and fan that came with the chip does just fine. Speaking of fans, the hardware runs very quietly while idle, and inevitably picks up the most noise from the graphics card's dedicated cooler while gaming. It's no deal-breaker, and certainly not a patch on the volumes produced under load by the Alienware X51's graphics card - the GTX 555. It runs quietly overall, and under load holds out at a maximum of 60 degrees Celsius. "Futuremark 3DMark 11 scores reflect a surprisingly capable performer that belies the modest investment in the DFPC's core hardware." So let's see it in action. To start, we run the rig through a series of graphics and physics-based tests with 3DMark 11, culminating in a combined run. Here we have results for Performance, which runs the sequence at 1280x720 on moderate load, as well as the 1920x1080 Extreme settings designed for high-end gaming PCs. By comparison to the Alienware M14x laptop we reviewed recently - which costs in the region of £1000 more than the DFPC - we see some surprisingly close results. The overall score is higher on the desktop by almost 100 on each standardised test, though the M14x's graphics card is capable of pushing out a far higher physics score, which is probably down to the much weaker CPU. Otherwise, the performance lead is present, and respectable given the performance per pound. Next up, we run through a similar gamut of Batman Arkham City tests to the ones conducted on the laptops we looked at last week, with the set resolution at 1366x768. The goal here is to see how the graphics card's GDDR5 RAM copes with increased anti-aliasing. This is run at three levels; from the post-processing approach offered by FXAA, to the more GPU-intensive 4x and 8x MSAA settings. For everything else we have the graphical preset set to high, albeit with PhysX and v-sync disabled to allow the frame-rate to float above 60. Meanwhile, we have ambient occlusion checked. For fans of the duo of Batman games the results are very impressive, and the demo shows the flexibility of Unreal Engine 3 with regards to lower-end setups like this. Batman: Arkham City Benchmark: DX9, 1366x768, high detail, PhysX off, all other settings enabled. Curiously, raising the stakes on the edge-smoothing doesn't impact the HD 6770 at this lower resolution, where we see an average 71FPS across the board. For those looking to get rid of the egregious screen-tear that kicks in over flashing lighting effects, this essentially qualifies it as a full 60FPS game when locked, with the major dips only occurring when faced with a long view of the city streets. To throw another variable into the mix, we also run this series of tests on the DirectX 11 settings, with tessellation set to normal. In theory, the setup here should fully support these features, although we do expect to see additional effects such as horizon-based ambient occlusion have a greater impact. As you can see, results take a noticeable hit in general, and we perceived a very distracting judder throughout the tests. This manifests as stutters in places, which no doubt accounts for the string of 1FPS values we see as a minimum. "Arkham City's benchmarks suggest that we can enjoy a rich visual experience with our combination of a modest dual core CPU and Radeon HD 6770 GPU." Batman: Arkham City Benchmark: DX11, 1366x768, normal tessellation, high detail, PhysX off, all other settings enabled. Looking strictly at the averages, we're getting comparable results to the M14x when set to DirectX 11, where both the laptop and the DFPC even achieve a matching 36FPS average for the full 8x MSAA. From a bang-for-buck stance this counts as a very favourable showing for the desktop, though the game experience itself doesn't feel palatable without engaging a 30FPS frame-rate cap to keep refresh consistent. The last test is Metro 2033, which comes packaged with a handy Frontline benchmark that throws the camera through a trail of train-wrecks showered in bullet-fire particle effects and an impressive lighting engine. We keep settings for this as consistent as possible by maintaining our HDTV resolution of 1366x768, while dropping the overall quality preset to Medium and enabling the DirectX 11. The high demands being made here don't tend to flatter many desktops (max settings can bring a GTX 680 to its knees) though we do enjoy a 5FPS boost in performance over and above the M14x. The tests are being run with no v-sync engaged either, which suggests that even a capped frame-rate would cripple the performance further. Metro 2033 Frontline Benchmark: DX11, 1366x768, medium detail, PhysX disabled. "The need to max out PC games with ultra settings propels technology onwards, but reasonably paring back quality levels and resolution still produces an experience leagues apart from consoles." The sweeping pass through the initial section, featuring fire elements and exploding barrels brings the test down to its lowest level, but the addition of 2x MSAA doesn't appear to impact performance to quite the same extent as Batman when using the same API. A quick test of the same settings running at the higher 1080p resolution gives us 10FPS, meanwhile; a result that would likely see improvement if we paid £50 more for the HD 6870 graphics core. This potential upgrade is something we'll be investigating in greater detail in the near future. There's only so much a raw average benchmark value can relay however, so let's see how our in-game tests showcase some of the more demanding titles in practise. Here we have three of the biggest PC releases of the last two years: Battlefield 3, Skyrim and Crysis 2. As per our Face-Off features, we capture each gameplay clip losslessly and pit our budget PC against matching gameplay footage from the PS3 and 360 versions. We've even thrown in comparisons with the M14x to give the gaming laptop scene some representation. As per our previous PC GPUs tests, we engage v-sync here. It limits top-end performance to 60 frames per second and on under-powered hardware, it can cause judder when frame-rates drop - but we feel it's such an important element of overall image quality that we should have it engaged. We take to one of the most demanding sequences in Skyrim for our tests: the on-rails intro scene. Here we see all four versions take a relatively large hit to performance compared to the general flow of play outside, largely as a result of the number of NPCs being condensed into one place. For settings, we stick with the laptop standard of 1366x768 - a 13 per cent increase over the console's native 1280x720 output. It's a resolution we like not only because we can carry out direct tests with the laptops, but also because it's the native resolution of virtually every non-1080p "HD Ready" HDTV out there. We also stick to the high graphical preset, with 8x MSAA and 8x anisotropic filtering selected, which already puts the image quality far ahead of the post-processed PS3 version. Engaging v-sync here also sets it apart from the 360 version, known for tearing across the screen during battles where spells are a heavy fixture. "Our £300 PC plays Skyrim remarkably well on the high quality setting - higher res, more effects, higher quality textures, higher frame-rates and longer view distances than both home consoles." 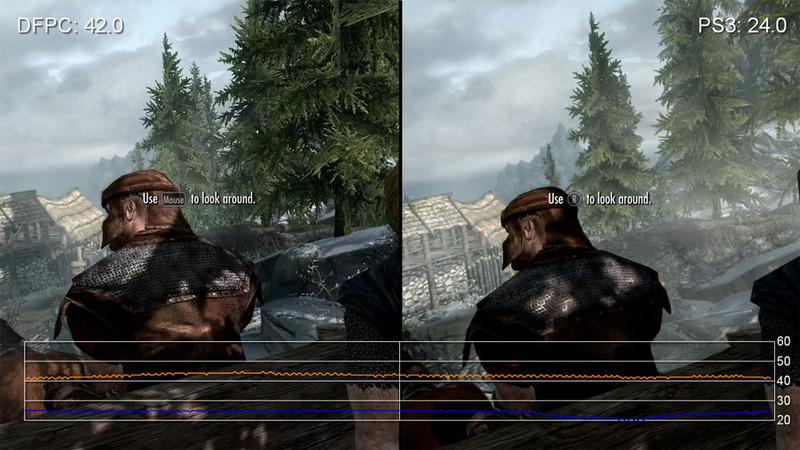 As you can see, the performance lead over PS3 is tangible, though it still strays from that target 60FPS for most of the journey towards Helgen village. Arriving there brings it to a smoother level, which stays a long stretch ahead of the PS3's v-synced 30FPS, and is achieved with further draw distances on geometry and NPCs. Comparing it to the 360 makes for a similar story, but also benefits from the removal of intermittent tearing, which bursts in across the whole screen. Image quality is just about identical to the M14x capture due to the same settings used, meanwhile, but surprisingly both perform at a highly comparable level, with 40FPS being the baseline from which each deviates slightly on the descent downhill. Bumping the game up to 1080p drops that down much further, but can be compensated for by removing the multi-sample anti aliasing. Otherwise, 1080p30 is a very sustainable target here, which may be a significant option to those for who value image quality over performance. 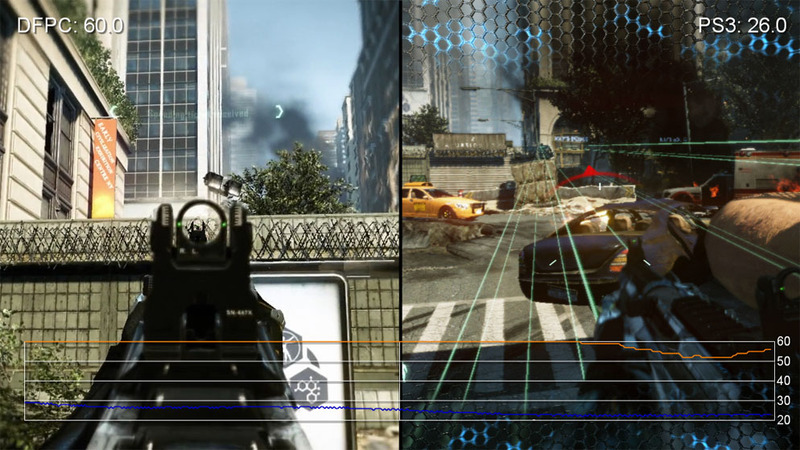 DICE's flagship shooter is one of the few games available on PC that happens to be optimised for quad core CPUs, and which natively supports DirectX 11 features, such as horizontal-based ambient occlusion. When it came to playing this on our dual core CPU, the possibility that we'd made one compromise too many in the pursuit of the best deal loomed large. 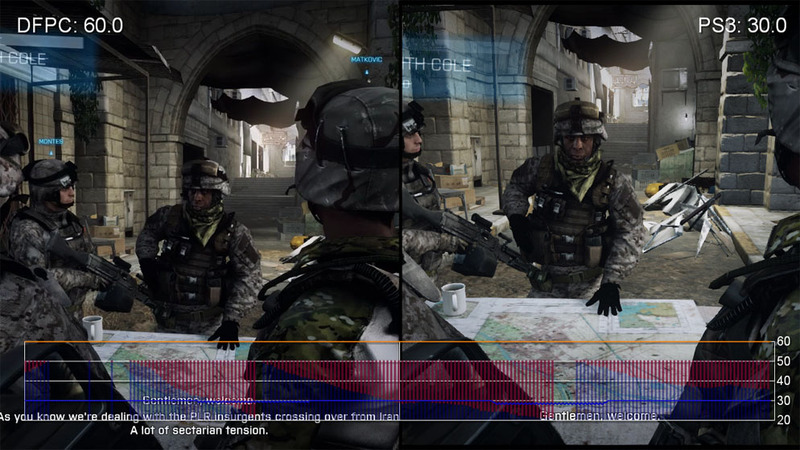 Fortunately, Battlefield 3's performance on our budget PC generally stays clamped between the 50 and 60FPS lines on our graph when set to medium preset at a resolution of 1366x768. It only ever finds itself erring from that area during the big battles on the motorway towards the end, where exploding tanks cause repeated, lurching dips to 45FPS - a pitfall mirrored by the other platforms at the same point. It's not quite smooth enough to qualify it as perceptual 60FPS (by which we mean an experience comparable to Call of Duty on Xbox 360 - frames are dropped but it's hard to notice for most players), but the frame-rate is exceptionally playable in any scenario besides these big, outdoor battles. "Battlefield 3 was the game we felt could bring our dual core system to its knees, but gameplay at 768p is fine, and a capped 1080p30 is achievable with decent visual quality settings." This gives us options. One viable approach to optimising the experience involves entering the command "gametime.maxvariablefps 30" to force the engine down to a locked 30FPS. As well as evening out the peaks and troughs to the performance, we can also happily bump the game up to 1920x1080 and see no stutter. The minimum refresh never goes below that value, which in itself makes it a smoother performer than the PS3 and 360 versions, each known for dropping v-sync and falling below the same target. Texture quality, effects and shadow draw are much improved on PC too, even on medium settings, where the pop-in on shadows for the console versions suggests that they're running at an equivalent to the low preset. Compared to the M14x, we again have a matching resolution and graphical quality setup for our tests. Unlike the neck-and-neck comparison with Skyrim though, we find ourselves playing Battlefield 3 with a markedly superior performance on the desktop - often by 10FPS at any point. Last up for video analysis is Crytek's Crysis 2. Right off the bat, we find that DirectX 11 support is a no-go; the game can play at a perfect, unfaltering 60FPS with it enabled, but motion is regularly interrupted by intense bouts of stuttering. The bottleneck proved difficult to pinpoint, and Googling "Crysis 2 stutter" offered plenty of matching experiences, but no viable solutions. We added another 4GB block of RAM, and also exchanged the graphics card for a Radeon HD 6870, but to no avail. It's a curious performance issue that we also found to be the case with the Acer Ultra M3 - but not the M14x - and it ultimately lead to us ruling out tests on this setting in favour of DirectX 9, which still offers a stunning, console-beating experience. The high resolution texture pack remains checked here, and we run through the same tests as before. Our PC runs at the same 768p resolution as before, with v-sync engaged and at very high settings selected, with the resulting performance sticking very firmly to the 60FPS line. "Crysis 2 DX11 stuttered badly - a situation not resolved by doubling RAM or upgrading to a Radeon HD 6870. With the DX9 renderer and the high quality texture pack, performance is very pleasing indeed." Compared to the PS3 version's native resolution of 1024x720, the bump in clarity does wonders for distinguishing the outlines of distant enemies. We also see the console version's frame-rate dropping off the bottom of our graph, below the 20FPS mark, at moments where the refresh is at maximum for the DFPC side. It's a huge leap in performance, though pushing the boat out towards extreme settings shows us the PC's limitations in dealing with higher quality post processing and shading effects. On the plus side, objects, particles and shadows can be individually bumped up to extreme quality without any major performance penalty. A look at the M14x's performance here by contrast gives us mixed results. For the first scene where the submarine capsizes, we find the DFPC wins out through its superior handling of water and particle effects. That said, one scene involving a long, distant view over the docks leaves the Alienware laptop in the lead by a wide margin - and neither platform truly fares better than the other during the shoot-out involving multiple grenades towards the end. Understandably, we're throwing ourselves at the deep end with these three titles, so we also take a quick look at performance in older and also generally less demanding PC titles popular today. To kick off on a wholly positive note, we play through games like Call of Duty: Modern Warfare 3, Dirt 3 and Portal 2 at 1366x768, with High settings and 2x MSAA enabled, and in each case we manage to land ourselves an easy 60FPS average in FRAPS. In our bid to match the performance on console, v-sync is applied to all these games in order to stick to that refresh, but in these three cases there's enough processing power going round to potentially fire it up further with 120Hz monitors. For our 1080p tests, we play through the introductory battleground scene in New York for the Modern Warfare 3, a single-player Cross Rally in DiRT 3's case, and the initial scene involving Chell's room crumbling in Portal 2, and here all but the racing game manage to play without a hitch The main problem with DiRT 3 is the presence of too many other cars on track, though for solitary rally races this works out well. Taking it further by bumping the preset quality up to ultra gives us a massive drop to 47FPS though. "The DFPC can handle Modern Warfare 3 at high settings at a sustained 1080p60, with other titles proving to be almost as impressive. Performance overall from this £300 PC really took us by surprise." While we designed this machine to give good image quality and high frame-rates at 'HD Ready' 1366x768, we were pleasantly surprised to see titles like Modern Warfare 3 and Portal 2 looking quite superb at full 1080p60. Next up, we try Diablo 3 at 768p with high settings for textures, physics and clutter density. Shadows are also kept at this setting, although we find additional smoothing tips performance over the edge during our tests, which involves a run from New Tristram to the next waypoint. Turning v-sync on forces an adaptive refresh that conflicts with the idea of running everything maxed out. For anywhere around New Tristram town and the nearby roads, the frame-rate holds out at 60FPS with no caveats, but once you add either anti-aliasing or the smoothed high quality shadows in, performance becomes intolerable. Unfortunately, if the frame-rate dips below that number - such when surrounded by too many enemies around the Old Ruins waypoint - the frame-rate plummets straight down to 30FPS, making for a very jarring transitions along the way. So what to do? We find the solution simple: keep that shadow quality down to high without smoothing, and there's more than enough head-room to avoid these stuttering problems. Given the distance between the camera and your character, the light pixellation to character shadows at this setting doesn't have a big impact on the overall look of the game, and is more than made up for with the resulting performance boost. For those wanting to play Diablo 3 at full 1080p60, we have good news. If you're happy to untick the anti-aliasing checkbox, performance holds at 60FPS here without any trouble at higher resolutions. Much like in StarCraft 2, the absence of AA doesn't grate due to its carefully toned art style, so leaving this off for the benefit of performance makes for a good order of priorities. "As long as you're OK with some compromises, the DFPC is a highly capable performer at both 768p and 1080p across a range of the best PC gaming titles." On the topic of Blizzard games, our 2v2 replay game of StarCraft 2 runs perfectly while fully v-synced at both 768p and 1080p, but does drop to 45FPS during battles on High where quick responses are tantamount to victory. For the competitive player, the best bet here is to stick to medium where 60FPS is a constant. This retains the superior shaders and higher polygon unit models we see at the higher graphical profiles, but without the CPU-reliant physics and reflection effects to bog it down when units start knocking heads. So far so good, but the two games that refuse to run perfectly regardless of graphics settings and resolution were Rage and Saint's Row The Third. In the case of Rage, we try switching texture cache and anisotropic filtering to low, and turning off texture detail, but the buggy ride through the wastelands at the start still hiccups regularly enough for it to be distracting. With its Megatexture system being notoriously dependent on swift HDD access speeds - which isn't a luxury we have here - our AMD graphics card also doesn't have the GPU encode option to its benefit. This is an NVIDIA exclusive mode which allows for texture data to be streamed directly from its GDDR5 RAM, and would have helped greatly with the stuttering. As a result, the game has issues that can only be lessened by increasing the texture pop-in and turning off AA, although 1080p at maximum settings can be playable at a locked 30FPS on this card. Last but not least, we find the absurd sandbox stylings of Saint's Row The Third too much for our PC to handle when targeting a 60Hz refresh. Once again, dropping the settings to the low preset and playing through the initial heist mission (including the battle with the helicopters) at 768p gives us no better than 51.8FPS on average. Increasing the resolution to 1080p, but keeping the graphical quality the same doesn't impact this too drastically, making this the ideal way to play given the restrictions. Potentially, we can see a 30FPS cap coming in great use here. The compromises in designing a PC under such a strict budget are evident in these cases, but overall, the results here truly surpass our expectations. Without breaking the bank, we're able to play games such as Battlefield 3, Skyrim and Crysis 2 at far higher resolutions than the consoles are pushing out, plus with broadly improved levels of visual detail, and at frame-rates within reaching distance of the 60FPS mark. It's especially impressive that contemporary favourites like Modern Warfare 3 and Portal 2 run so flawlessly too, where the PC stays in permanent contact with that target frame-rate while running at maximum settings and 1080p. No problems here at all. So are we seeing the 4x console power we mentioned in the tagline? Admittedly, it's an imprecise comparison, but it's clear we're seeing a huge leap in many areas borne out by the results we see. Comparing the Radeon HD 6770 to the Xbox 360's Xenos GPU, we see around 5.6x the shading throughput, around 3.4x pixel and texel throughput but only around 1.7x triangle output. But even at 'just' 4GB of RAM we have far more space to play with, and the Sandy Bridge CPU should effortlessly outperform the 360's Xenon in most tasks. To give a gameplay comparison, Modern Warfare 3 on consoles is 600p60 with frame-rate drops while our unit is locked at 1080p60 with higher quality settings. Factoring in all this in, 4x seems like a reasonable assumption to make - and the beauty of PC is that you're free to upgrade any component any time you want, increasing the gulf still further. "As an entry point to PC gaming, our budget spec seemingly works miracles. But what of the future? This will depend on just how ambitious, or price-conscious, Sony and Microsoft are with their new hardware designs." Going forward we aim to use the DFPC in all of our Face-Off coverage, but we fully accept that the machine may require upgrades - especially when next-gen consoles roll out. More dedicated enthusiasts with an extra £150 to spare may wish to consider an Ivy Bridge quad core CPU and a Radeon HD 6870 for higher performance in the here and now. As an entry point to the world of PC gaming, the stubbornness of this budgeting philosophy works to our favour for most current generation titles. But what of the future? The specs of the next-gen consoles will be the defining factor here, and right now, nobody knows what they are. If - as expected - Sony and Microsoft aim for a £300 price-point, there's a suspicion that they may not be quite as powerful as we hope. But in the fullness of time, the DFPC may well need both CPU and GPU upgrades. As the most likely bottleneck, the HD 6770 GPU would be the first to get the exchange, and swapping it out for a card on par with the HD 6870 would result in a doubling of the overall pixel fill rate, allowing for much higher resolutions and AA settings. The use of a socket 1155 motherboard here also means upgrades to Core i5 and i7 CPUs are possible, and while benefits to gaming are questionable in the here and now, the remaining empty DIMM slot can potentially be filled with an extra 4GB of RAM. On top of this, the ease of use and flexibility of the case and power supply should give these parts a degree of staying power for most future configurations. To keep track of how competitive the DFPC remains going forward in this time of transition, we plan to put all future Face-Off titles and PC exclusives through their paces, and we'll track any upgrades we feel we need to add. But with our PC's current balance between price and performance, the need to upgrade may not be so immediately necessary for those keen to do a bit of tweaking. Where games simply can't hit 1080p60, capping some of the more demanding titles at 30FPS works wonders in maintaining a consistent sense of motion, and allows surplus processing power to be put to better use elsewhere. It's not the ideal; this is a low-end gaming rig after all and concessions will have to be made. However, the cost-efficiency of its components means that most games will happily play at medium graphical settings or higher without any meddling at all. When considering the costs of rival laptops and consoles, the net results here are very impressive indeed.